The motorcycle gang called it the “church meeting,” a cute euphemism wrapped around business dealings federal prosecutors would later argue were racketeering-level criminal felonies. It was held each week. They collected at the Mesa clubhouse, a murky bar-like space where a jukebox leaked Steppenwolf, closed blinds hid the sun, and a 12-foot “death head” mural spread across a wall, according to a former member. When the door was bolted shut, the Hells Angels inside fine-tuned various schemes, including methamphetamine sales, indictments would later charge. The gatherings drew a hard crowd — tattooed hog-riders with quick triggers for violence — including, strangely, a local Charles Schwab stockbroker. When the serious talk was done, the party started, the Arizona Republic reported in 2005. [post_ads]On Oct. 27, 2001, as the post-meeting revelry cranked into high-gear, a prospective Hells Angel was ordered to find some girls. He returned with Cynthia Garcia. As she partied with the Angels, the 44-year-old mother of six began “talking trash” about the club and its members. When the wisecracks kept flying, the Hells Angels allegedly started beating Garcia, an arrest affidavit written by a Bureau of Alcohol, Tobacco, Firearms and Explosives agent would later claim. They allegedly stomped her with their boots as she lay on the clubhouse floor. They loaded the semiconscious woman into the trunk of a car. They motored off into the Arizona desert. Garcia’s body was found on Halloween. She had been stabbed nearly 30 times, and her killers had tried — and failed — to cut off her head. Two years after the murder, a federal investigation called Operation Black Biscuit bulldozed into the Mesa chapter of the Hells Angels. More than a dozen members were indicted on federal criminal charges including drug trafficking and conspiracy. The investigation also prompted murder charges against two Hells Angels associates for Garcia’s death. But one of the alleged killers, Paul Eischeid, didn’t stick around for his day in court. He allegedly hacked off his ankle monitor and disappeared overseas, the Phoenix New Times reported. Fifteen years after fleeing, Eischeid returned to Arizona last week in handcuffs to face charges related to Garcia’s death, according to a statement from the U.S. Marshals Service. In 2011, the fugitive was tracked down to Buenos Aires, where he was living with an Argentine wife and son. For the last seven years, Eischeid has fought his extradition to the United States, drumming up support in his adopted country. His legal options were recently all burned out. 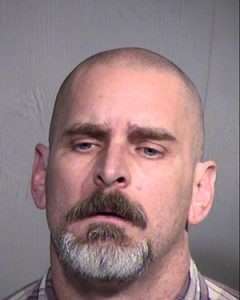 The 46-year-old is now being held in the Maricopa County Jail. His attorneys at the Maricopa Public Defender did not return a message for comment. The extradition is one of the unresolved legacies of Operation Black Biscuit. Although the investigation was celebrated for successfully drilling into the secretive world of a criminal motorcycle gang, the operation also was targeted by critics as an example of government overreach. Eischeid, however, was unlike his co-defendants. His alleged criminal activity was complemented by a life in the straight world. By night a motorcycle gang member, by day he was Charles Schwab stockbroker. The squeaky-clean-seeming side of his split personality was partly the reason Eischeid was able to escape in 2004. Strip off the white-collar veneer of the finance world, and a different Eischeid emerged. Thickset at 5’5 and 190 pounds, his chest, back and arms were swirled over with tattoos, according to photographs contained in court documents. The body art included Hells Angels’s death head insignia. “Hell 666 Bound” stretched over his lower back. ” His surname arched over his belly in gothic ink. Originally from Council Bluffs, Iowa, Eischeid left the state in the 1990s, the local newspaper reported in 2004. By 2001, he was a prospective member of the Mesa chapter, the ATF affidavit stated — not yet an official Hells Angel, but working his way into the ranks. But the stockbroker already had earned a reputation within the gang. According to the ATF affidavit, Eischeid and another member, Kevin Augustiniak, were among the Hells Angels who brutally beat Cynthia Garcia at the Mesa clubhouse on October 27. The stockbroker’s car was allegedly driven up to the back of the clubhouse, and Garcia’s unconscious body was tossed in the trunk. Eischeid, Augustiniak, and a third man — identified by the Republic as Michael Kramer — then drove out to the desert, the government claims. There, after dragging Garcia into the wilderness, “Eischeid, along with the two others, stabbed Garcia repeatedly with knives in the torso, head and neck areas until she was dead,” the affidavit stated. Augustiniak allegedly tried to sever the victim’s head to “make an example of her,” the document said. The men allegedly then returned to the clubhouse, where they burned their bloody clothes. Not long after the murder, the pieces of Operation Black Biscuit clicked into motion. Undercover agents began infiltrating the Mesa chapter. But the government also found a source on the inside. According to the Republic, Michael Kramer contacted an ATF agent a month after Garcia’s death. 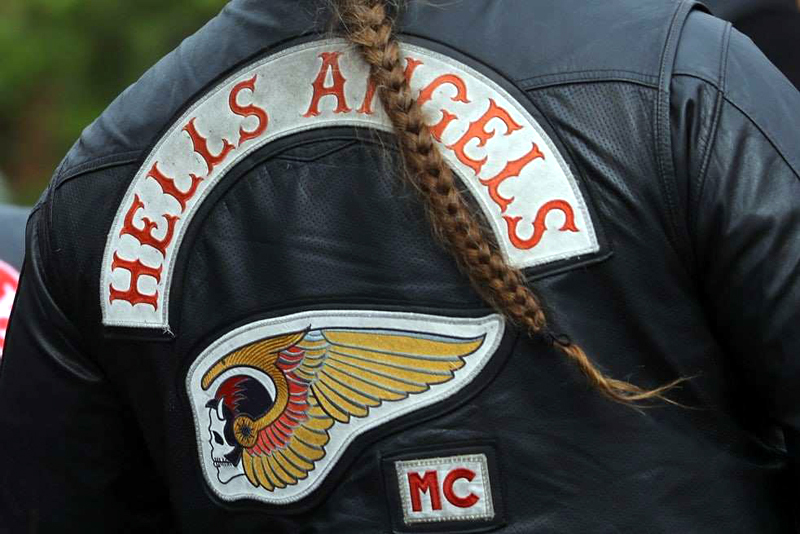 The Hells Angel offered to become an informant. The murder sparked his conversion. But Kramer did not initially tell his new ATF handlers about the murder or detail his own alleged role in Garcia’s death. He only hinted he had information about a “hypothetical” incident in Arizona, the Republic reported. Kramer was signed up as a paid government informant, earning $500 a week to set up gun and drug buys while the investigators watched. Despite orders to engage in no criminal activity, the Hells Angel reportedly continued to smoke and deal meth, and beat a man with a baseball bat while on the government’s payroll. Two months after joining the investigation, Kramer told his handlers about the killing. He offered to help authorities make a case against Eischeid and Augustiniak in return for immunity, according to the Republic. His conversations with the two murder suspects were recorded by authorities. In one talk with Eischeid, Kramer reportedly brandished a pair of expensive knives as gifts to his fellow gang member — for the next time they needed to decapitate someone. “I figured this time, you know, instead of having to do it 50 times, we could just [take] one good one and a good [expletive] twist,” he told Eischeid, referring to the Garcia murder, the Republic reported. In January 2003, Kramer took a plea deal with local authorities, agreeing to five-years of probation for Garcia’s murder. He did no jail time. Eischeid and Augustiniak were arrested for the killing. When Eischeid appeared at a bail hearing, his dayside life played well before the judge, according to “Angels of Death: Inside the Bikers’ Empire of Crime,” a book on the case by Julian Sher and William Marsden. At the time, Eischeid was making $3,000 a month as a stockbroker. He had $300,000 mortgages on two homes in the area. His criminal record was clean. “The government has a burden to show Paul Eischeid is a flight risk,” his lawyer told the court, according to Sher and Marsden. The judge ruled Eischeid could wait out his criminal case from home with an ankle monitor. Sher and Marsden reported that the next summer, after Eischeid and other members of the chapter had been indicted on federal RICO charges, the stockbroker threw a party at his home five miles from where Garcia’s body was dumped. It turned out to be a goodbye celebration. The next day, Eischeid fled the country. Investigators later learned a friend had applied for a passport in his name using Eischeid’s details. The document was passed over to the murder suspect, who used it to flee, the Phoenix New Times reported. The friend later pleaded guilty to one charge of providing false statements in an application for a U.S. passport. In 2007, Eischeid was added to the U.S. Marshals Service’s “15 Most Wanted” fugitive list. His co-defendant in the Garcia case, Augustiniak, later pleaded guilty to a second-degree murder charge for his part in the killing. He was given a 22 to 25 year sentence, New Times reported. Investigators eventually tracked the fugitive down to Buenos Aires, where he was arrested in 2011. “He put on some weight, had a goatee with the beard part down to his chest, and he’d shaved his head,” a U.S. Marshals official said at the time. As Eischeid fought his extradition, however, his case gathered support in Argentina. An online petition on his case, arguing the charges against him stemmed from the testimony of a paid informant. It has more than 4,000 signatures.